The most critical factor in how a fish finder performs is the installation of the transducer element. Even the best electronics cannot overcome the laws of physics, so proper installation of the transducer will allow performance to meet equipment specifications. Any deviation from perfect starts to impact this performance. There are several types of transducers; transom mount, thru hull, pocket mount, and in-hull are the primary types. For all of these (excepting the in-hull type) smooth, unobstructed water flow across the face of the transducer is critical and all efforts have to be made to ensure this. There should be no air or separation of laminar flow across the face of the transducer. Air bubbles can blind the sounder to the point that nothing can be seen on the display. In order to achieve this clean flow of water across the face of the transducer, there should be no hull penetrations forward of the installation. Strakes, intakes, or other equipment that is ahead of the transducer will almost certainly effect the water flow and what can be seen on the display. With this goal in mind, attention to detail in the fairness of the hull form to transducer face can make a substantial difference in the performance of the system. Any disruption ahead of the element, including caulking bumps or voids, leads to disrupted flow and diminished performance. Sometimes meeting this goal requires skills only learned from experience. For example, here is a major name brand production planing hull that is not actually flat. It is important to bed any fairing block to the hull to provide a stable installation. Artifacts from vibration and movement of the fairing and transducer take away from optimal performance. Some installations are more challenging than others and require compromises. This may be having to move to a transom mount because of the trailer, or placement not being in the ideal location due to bilge constraints. It is, however, fundamentally important to minimize any air bubbles across the face of the transducer. So, if your fish finder performance is not what you might expect, start with evaluating the transducer type and how it is installed. It's the little things that make the difference! Fishfinder; What do I see? As a lifelong commercial fisherman and engineer, I have always tried to use the tools at hand to improve my harvest. Many spring tides ago, I remember looking at a flasher and thinking it was amazing that it could see below the boat, but it took several years of trial and error experience to interpret all of the information on the dial. Fast forward several decades and it's possible to still buy a flasher, complete with colored lights, but how to understand what a fish finder is displaying is one of most often asked questions I get. 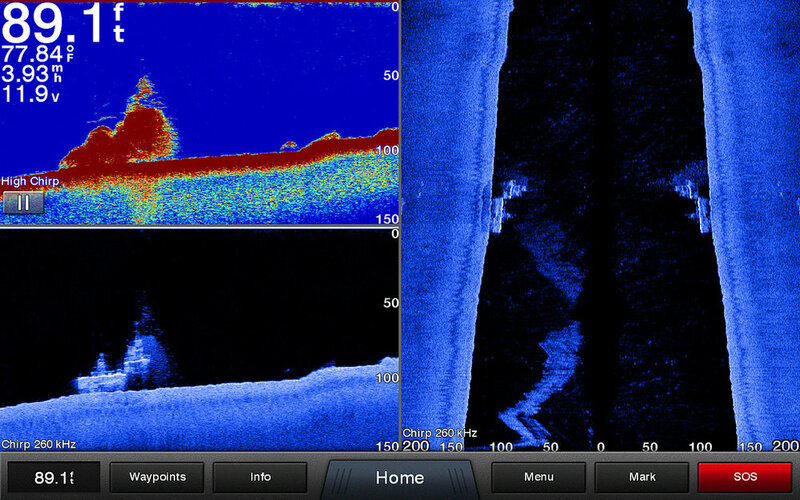 Some of the latest developments in echo locating fish include broadband transmission, higher frequency emissions, and modified transducer element shapes. Some of the imaging is incredible and can provide picture like quality making finding fish as easy as looking at a photo. Physics limitations still apply, so understanding the physical characteristics of the transducer and how sound waves are effected by water play the most significant role in using these devices. While fishing for salmon I grabbed some screenshots that demonstrate some of the nuances in interpreting what is below the surface. Looking at the screenshot above, note the low frequency 50kHz is displayed on the left and a high frequency 200kHz image on the right. We know that lower frequencies go deeper in the water column, while higher frequencies will give more resolution, or detail, further defining an echo return. There is another important characteristic of the transducer at play; beam angle. There is still more information to be had. There are some good returns near the surface, where salmon are between 20-30 feet of water. At this depth, the LF image covers 11' while the HF image covers 3' and represents fish directly below the transducer in 30' of water. This is an excellent example of why displaying both frequencies at the same time can give you that extra advantage. If only relying on the HF image, I may choose to move from this location, but the wider beam angle from the LF element shows me there is more going on just around the boat. We caught a bunch of fish. 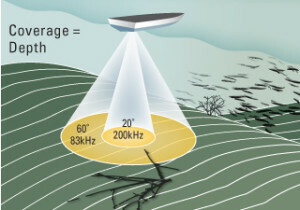 There are now transducers available that offer a wide beam angle in the higher frequencies. That allows for a display that is scaled correctly for different frequencies, at the expense of not knowing if the target was directly below the boat, or further off to one side. It does, however allow the comparison of different frequencies on the same target that can convey further information, such as species or size. Now I'm looking forward to phased array elements that allow for precise azimuth and bearing to a target. We can see the beginning of this development with products like the Raymarine Axiom using the RV100 transducer. 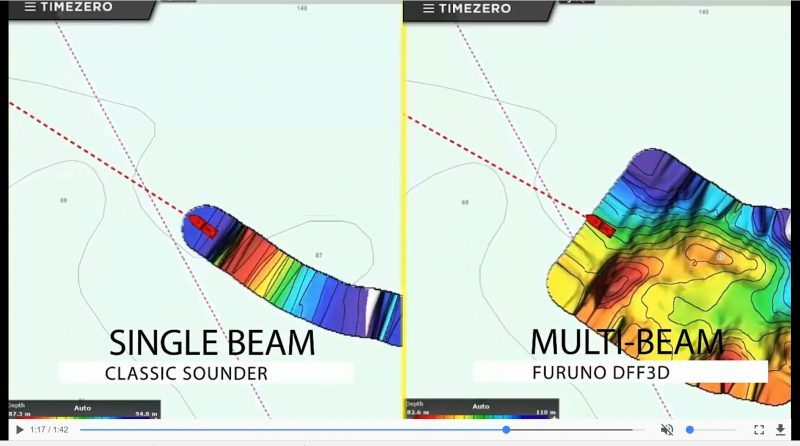 Not to be outdone, Furuno is also in the sidescan 3D business and offers hardware solutions that get down to 350m using the DFF3D and TM54 or B54 transducer operating in the 160kHz range. Any way you look at it fish finders have come quite a ways since the days of the humble flasher. Many hours of use for this diesel forced air unit show burned carbon residue from the fuel. Note the burned metal temperature sensor. I had just assumed that people realized servicing fuel burning appliances is necessary. However, several cases of service neglect have come across the workbench recently. And, in one case, an owner was surprised to learn that service is called for in the manual. These things burn fuel; sometimes dirty fuel. One of the most common question about these types of heaters and cook tops is the use of kerosene versus ordinary diesel fuel. It is perceived that kerosene burns cleaner, but the penalty is a short shelf life. Regular pump diesel has a longer shelf life, but the best of both worlds may be #1 winter blend. The picture at the top is from a high hour unit burning diesel from the boat's main tank, which in this case is large. Sometimes algae grows in the fuel and can lead to deposits like this. The issue with this over the long term are the hot spots created in the burn pot from the burning residue, as evidenced by the failed thermo-couple. All types of common diesel heaters have service intervals that should be followed for the best performance possible. After going through all of the cost and trouble to put a good quality heat shrink and adhesive lined electrical connector on, the last, and maybe the most important step, heating the jacket to seal it up, is skipped. This is something that we see regularly while crawling around boats. One might suspect that it is only the DIY crowd that would miss such a critical element; however, these pictures are from a factory installation. And there were several. The advantage of heat shrinkable connectors in the marine environment is the watertight insulating layer around the conductor mechanical interface to the connector. This prevents exposure to moisture. It also mechanically relieves strain from the conducting wire to connector interface. Foregoing shrinking leaves your electrical connections weak and open to the elements, leading to corrosion. Faulty connections may cause electronic malfunctions and other easily avoidable electrical problems. Save yourself the headache by using or borrowing a friend's heat gun to complete the connection. If a heat gun is not available, a blow drier on it's hottest setting may suffice. As always, use caution when applying any heat source. place with this technology, now referred to as AIS. range of other AIS-equipped vessels and provides another means of reliable communication by using ship-to-ship addressed text messages. This information can then further be displayed on a chart plotter or dedicated display to show the relative bearing from your own position. Some systems can be further integrated to allow DSC hailing directly from a chart display representation of the AIS target. In fact, the USCG believes that it is one of the most significant tools available to a helmsman for safety. It's just that not so many people have it. That is all about to change with the final regulations set to go into effect next month. It will now be required equipment for all commercial vessels over 65' or those over 26' and towing. In addition, those dredging or carrying dangerous cargo will be compelled to carry a class A device. A class B device can be used on the following vessels if they do not have pilotage requirements; fishing industry vessels over 65', over 65' and carry less than 150 passengers and over 65' while not in VTS, and are slower than 14 knots. SOLAS ships have to carry a class A with a heading reference. So, now that all commercial boats over 65', and any commercial boat carrying over 150 passengers, will be compelled to carry AIS by March 2016, maybe it will become a more useful tool for traffic avoidance. The problem has been that not enough boats have had the transponders. In crowded harbors such as the east coast, or Seattle, you can see many AIS targets on tracking sites like Marine Traffic or others. In Alaska, we have a severe abundance of wide open expanse and not very many AIS installations. I may only see a couple of AIS targets around if any at all. Those have mostly been large ships, but no more. With the large amount of commercial vessel traffic we see during our brief boating season in Alaska, this transponder carriage requirement will make it easier for all navigators to identify and communicate with other vessels, as long as you can receive AIS messages. And if you were ever concerned about being seen by large commercial traffic, then installing an AIS device on your boat will make sure you show up in a large boat wheelhouse, even if your boat gives a weak radar signature. The use of AIS systems for collision avoidance will only get better as more participate by carrying position reporting equipment of their own. But, as with all the high tech equipment in the pilothouse, always remember to keep a weather eye to the horizon and another on the radar. Why do I need a heading sensor? This conversation comes up frequently and it turns into a short discussion on exactly what a GPS receiver can and cannot do when it comes to figuring out which direction you are going...or in this case, heading. A GPS receiver alone has to do some calculations to figure out what it calls the COG, or coarse over ground. If you are moving along then the GPS has a place that it knew it was just a second ago and where it is right now. Some processing then produces a vector, or a velocity in a direction. That is your COG. As soon as you go very slow the GPS cannot determine your COG with any accuracy. If you point your bow 5 degrees starboard to compensate for a drift and to maintain your COG, then your heading is 5 degrees more than your course. A GPS receiver cannot compensate for this difference. The one exception being a satellite compass, which is really a heading sensor using multiple GPS receivers spaced a couple of wavelengths away from each other. This issue of heading versus course is a real issue when using an autopilot or radar. The autopilot is an obvious application needing heading input. Most major brand kits come packaged with what is called a flux gate compass. These solid-state sensors can detect the change in the earth's magnetic field as their orientation is changed. The newest models are NMEA 2000 compliant and are powered by the network at the same time. Using a heading sensor with a marine radar system opens up more features, such as MARPA target tracking, real motion target trails, and radar chart overlay that matches on the chart what your bow is really pointing to. It is also reassuring to be able to acquire a target on the radar and within a few sweeps, then know it's heading and speed. That information can be displayed as a motion vector on the chart showing where that guy is headed and if he is going fast or slow. 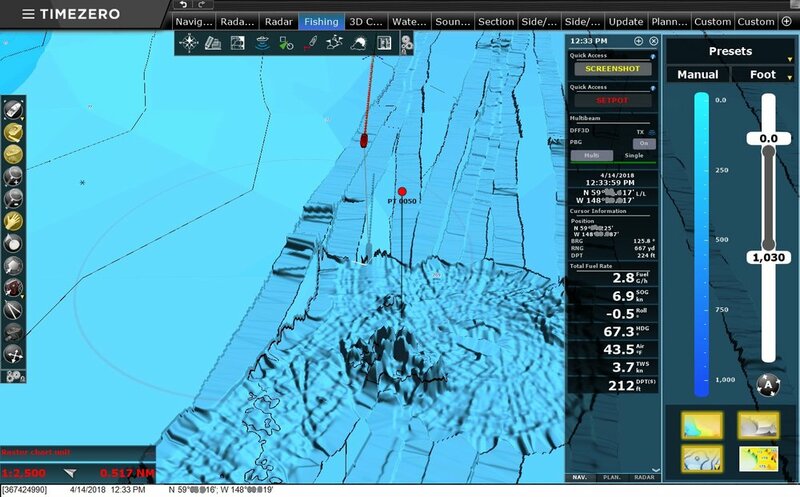 Even though AIS can do that and give more detailed information, AIS installations are on few boats and it is more practical to use radar for target tracking at this point. I have mentioned the two major types found today, a fluxgate type rate compensated solid state heading sensor, or a satellite compass. In both types, NMEA 2000 should be used to assure fast update times required by most manufacturer's equipment. Older NMEA 0183 type sensors may not refresh fast enough. Look for 100ms update times or better. Because of the features gained in the radar capability alone, the purchase of a heading sensor may be one of the most value packed electronics investments you can make. Now when you choose "heading up" orientation on a chart plotter, the bow is really pointing at what the chart shows even if you are stopped or ahead slow, circling for that perfect fishing mark. As usual, things are not so simple in the last frontier. The challenges are numerous when it comes to installation and maintenance of remote sites necessary for the Rescue 21 radio network. The Coast Guard describes Digital Selective Calling and the currently deployed Rescue 21 sites on their project website, with a special mention for Alaska and the projected time to deployment. The summary is that we can hope to have USCG monitoring of DSC calls over VHF sometime in 2017. It is still important to realize that even though the Coast Guard is not listening through their repeaters for DSC, many vessels do carry DSC capable VHF equipment. Any transmission using DSC over VHF would be heard by local area radios even without the shore installations the USCG is putting in. Relying on nearby vessels to hear your DSC call is more helpful during the brief but busy summer months in Alaska, with increased recreational and commercial traffic. This is something to consider if you have little time, but know there is boat traffic nearby and need to get a distress call out via radio. Sounds like a good plan, right? Chances are that one of those boats may likely have a DSC equipped radio since the technology has been available for 15 years, and required on all new VHF radios sold in the US since 1999 under an ITU standard SC-101 mandated by the FCC. That standard allowed for only one receiver in the radio to scan between channel 70 and the selected watch channel. It would then be possible to miss a DSC call on this type of radio. Now, the current requirements for VHF radios sold or installed in the US must be DSC Class D. These radios have a dedicated receiver for channel 70. All DSC calls are transmitted on channel 70, so having a dedicated receiver means that there is no chance for a Class D user to miss a call. So, since March 25, 2011, all VHF radios sold as new have been Class D radios and those built to earlier RTCM Standard SC-101 can no longer be manufactured, imported, sold or installed; however, previously-installed radios meeting the older standard may continue to be used. The Coast Guard urges, in the strongest terms possible, that you take the time to interconnect your GPS and DSC-equipped radio. Doing so may save your life in a distress situation! Before interconnecting your radio & GPS consult the owner's manuals. So verify your VHF radio system is up to the task by making sure you can also hear other boaters in distress through DSC. Taking the necessary steps now will ensure you will be able to not only hear others who may need assistance, but you will be able to instantly notify the Coast Guard when Rescue 21 is a reality in Alaska. One simple step that is often overlooked when installing marine radios and other electronics, is the use of a waterproofing dielectric paste. This compound, when used in mechanical connections like coaxial antenna ends used for VHF radios, will keep moisture from entering the connector and causing corrosion. This material can be found in electronics supply stores or online. It is one of the many things that can be done to improve the longevity of electronics and radio installations in the harsh marine environment.